Mini - brand small cars designed in the UK by British Motor Corporation in 1958 and manufactures various automotive associations and holdings until 2000. In 1994, as part of Rover Group sold the concern BMW. 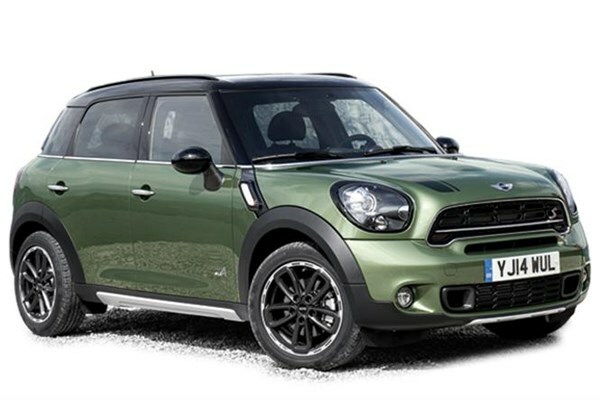 Since 2000, the MINI - a subsidiary of the company, a separate legal entity located in the United Kingdom and producing updated versions of cars. 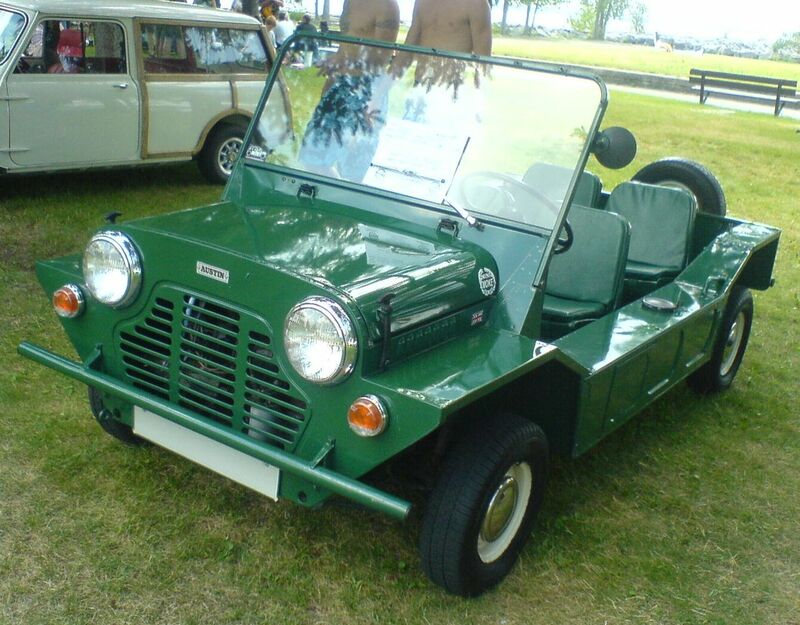 According to a survey conducted by 126 experts in 1996-1999 from around the world to identify the "car of the twentieth century" Mini took 2nd place, losing the lead only Ford Model T.
In 1952, the director of the Austin Motor Company has made Leonard Lord had long planned merger with Morris Motors, which he led in the early 1930s. British Motor Corporation - As a result of the new company was formed. Occurred in 1956-1957, the Suez crisis has demonstrated the reality of oil supply disruptions. At a time of gasoline for sale to consumers in the UK it has been normalized. Before engineers in many countries there was a question about the need to develop ultra-low car. In 1956 Leonard Lord led them to the corporation established a working group of 8 people (2 designers, 2 engineering students and 4 draftsman), which was headed by engineer and designer Alec Issigonis. Before the project team called ADO-15 (. Amalgamated Drawing Office project number 15, Russian United Project Design Bureau number 15) has been set a clear task - to create a car as tiny as possible. Options outside dimensions have been defined:. 3 × 1,2 × 1,2 m The second goal was to place it in four adults and their luggage. The most important in solving these problems was the idea of cross-linking four-cylinder in-line engine, water-cooled, and placing them under the gearbox, integrated with the oil sump. As a result, interior began to occupy at least 80% of the projection area of the vehicle. The first prototype, named for the color of «The Orange Box», was ready by 1957, but testing and completion took almost two more years. The first cars were put into production in May 1959, but by August the market they have been received to create the necessary reserves at dealerships. On the creation of a completely new car from concept to mass production it took 2 years 5 months. June 17, 1959 Chairman of BMC Leonard Lord first publicly revealed some details of the upcoming premiere automotive. He said that the new cars have passed a variety of tests and are ready for release. Corporation developed new production facilities and equipment using the most advanced technologies. The volume of investments has exceeded 10 million pounds. At the same time the Lord said that rather popular previous models Austin A40 and the Morris Minor will remain in production. The official start of the sales took place August 26, 1959. To this day has been collected a few thousand vehicles were exported in 2000 - sales have started simultaneously in nearly 100 countries around the world. Cars going in two plants: in Cowley (Oxford) under the name Morris Mini Minor and in Longbridge (Birmingham) called the Austin Seven. Last name (literally graphical representation Austin Se7en with some turning numbers clockwise, allowing to perceive it and how to "7" and as a «v»)  has been used "in memory" of the extremely popular small car of the 1930s Austin 7. overseas cars sold under the names Austin 850 and Morris 850 (from the rounded indicator of engine volume in cc). Nearly 20,000 cars have been produced by the end of 1959. The first experience of operating the vehicle revealed a number of shortcomings. Chief among them - the almost complete absence of waterproofing, in heavy rain, interior mats get wet instantly, at the floor of a starter arrangement is a big problem. Flaws were quickly removed and almost no effect on car sales. In 1960 it was issued for 3000 cars each week. 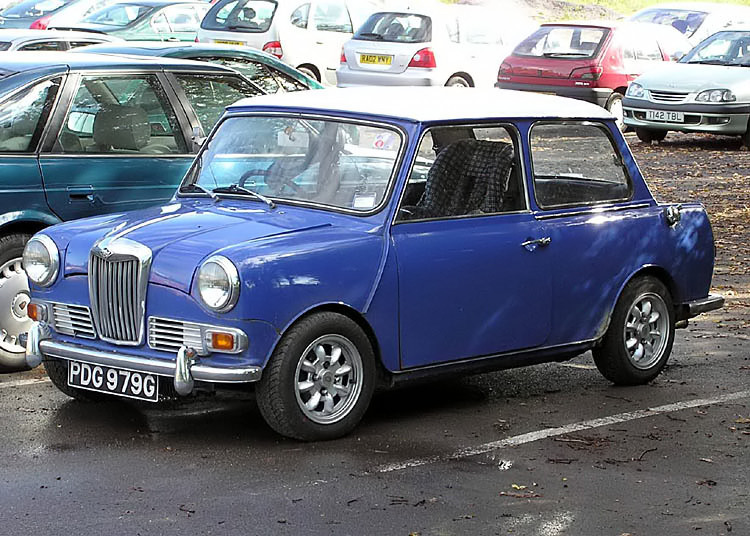 In September, it was proposed a modification of the station wagon Morris Mini Traveller and the Austin Seven Countryman. Austin Mini Metro - is a version of the car Mini, sold under the brand Austin and Rover. Another name for this model - Mini Shortie ( "Shorty"). Mini Metro appeared in the late 60s on the wave of popularity of ordinary Mini. The engineers decided to create on its basis "funcar", that is not a serious vehicle for advertising and entertainment purposes only. Mini Shortie have shorter wheelbase (even less than today's Smart car) and a double cabin. 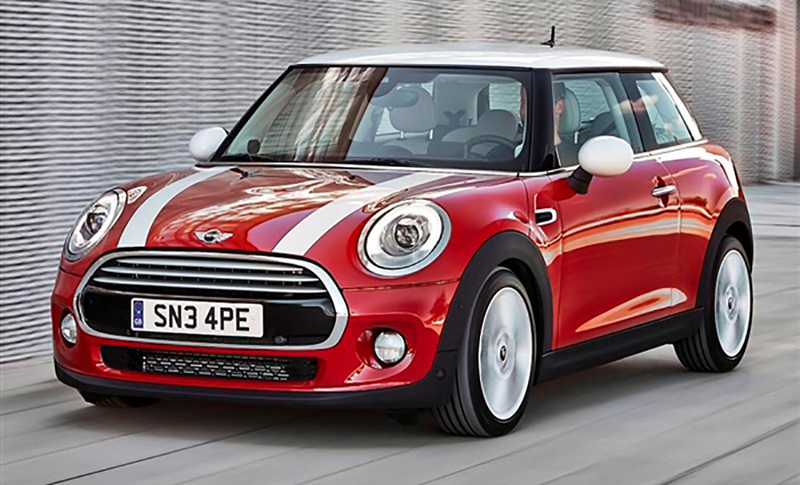 The entire line of engines from the usual Mini was placed on a shortened version. 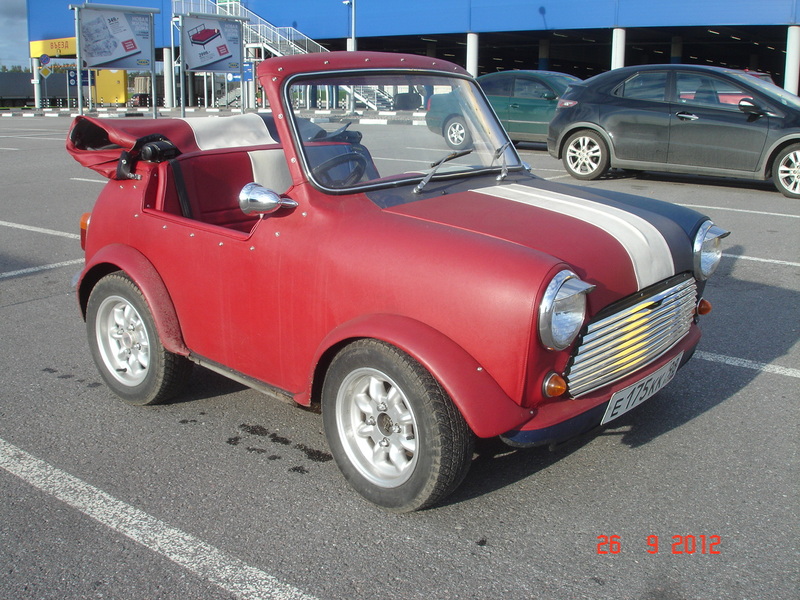 The most powerful, 1.2 liter, crumbs could accelerate to 140 km / h.
Basically Austin Mini Metro issued a convertible in the body with a removable top, but several cars in coupe hardtop also saw the light. There was no door convertibles, body type was monocoque, which had to jump through the car side. Since 1967, about 200 of these cars were built by 1991. 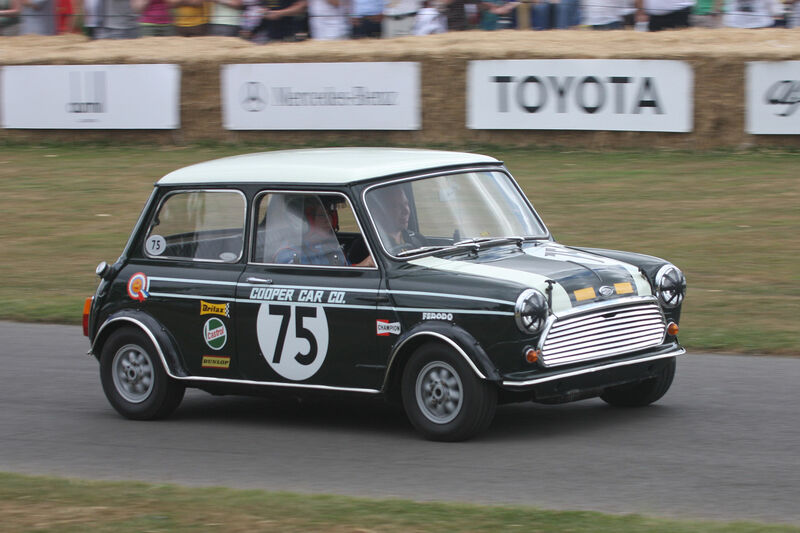 In 1961 - the team constructor Cooper Formula 1, was so delighted with the reliability and manageability of a small car, he decided to provide him with a more powerful engine, disc brakes and contrasting two-tone color, which later became the business card of Mini. Modification of the Mini Cooper became a welcome guest in the most prestigious neighborhoods of London. Prior to that, Alec Issigonis repeatedly refused proposals Cooper, citing what he did for the humble man in the street car. Making concessions renowned engineer, has just won two Constructors Championship of Formula 1, the corporation's management believes that it will be unable to realize more than 1,000 units improved model. Over the years the production has been sold 150,000 cars Mini Cooper. In 1963 there is a new model Mini Cooper S with an even more powerful engine. It is this machine has become a true legend of motorsport. In 1964 - Mini Cooper wins in one of the most difficult tracks in the world - in Monte Carlo. Drivers Paddy Hopkirk and Henry Liddon feted as heroes and the vehicle, who challenged and tempted larger rivals, forever entered the history of motor racing. The victory was not accidental: in the next year, the team of Timo Makinen and Paul Easter also rose to the highest step of the podium, and in 1967 Mini Cooper S Rauno Aaltonen running and Henry Liddon was again the winner of the Monte Carlo Rally.